Standard & Poor’s director of sovereign ratings, Liang Zhong, discusses the current challenges facing local governments and why a systematic crisis is unlikely to happen in the near term. The wave of defaults that some observers predict for Chinese local government financing platforms (LGFPs) this year may not be as numerous as they expect. Standard & Poor’s Ratings Services believes that China’s local and regional governments (LRGs) could prevent system-destabilising defaults of their financing platforms despite slower growth in revenues in 2012. What are the key challenges facing LRGs in China in 2012? Slow down of revenue growth and pressure to increase social spending are two key challenges facing LRGs in China this year. We expect most LRGs’ total revenue — defined as the sum of general budget income and government fund revenue — to grow much slower in 2012 compared with the past two years. This is due to slower economic growth and the central government’s continued structural tax cuts and restrictions on housing purchases for investment purposes. In the first two months of 2012, the aggregate general budget revenue (excluding central government transfers) grew at only about half the pace as in the same period of 2010 and 2011. And the local general budget revenue of Beijing’s municipal government actually contracted compared with the same period last year. Meanwhile, LRGs are under pressure to increase social spending. They will therefore find it difficult to finance both new investment projects and those that are already in progress. So despite slower growth in LRG revenues, why do you believe that numerous defaults are unlikely? We believe LRGs could provide sufficient support for their financing platforms to prevent any system-destabilising defaults, despite a likely decline in revenue growth for these governments. We expect LRGs to benefit from stronger financial management and possible asset sales to support LGFPs’ interest payments. Moreover, more accommodative central government policies should enable LRGs to help LGFPs get the refinancing they need when a possible default could have systemic ramifications. Ultimately, we believe the central government would also provide more direct financial support to LRGs and LGFPs to avoid any systemic crisis. 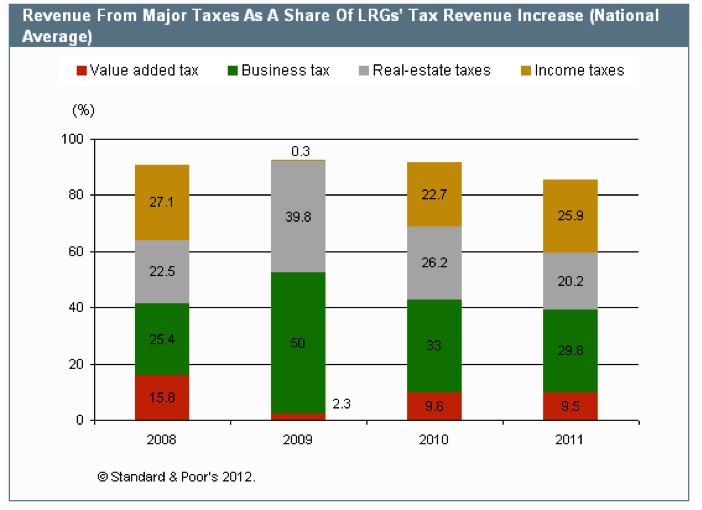 What is your outlook for tax revenue growth for LRGs in 2012? We expect Chinese LRGs’ tax revenue — which makes up about a third of their total revenue — to grow much slower in 2012 than over the past two years. All the major factors that can boost tax revenue — including income taxes and taxes on real estate (see chart 1) — would suffer in the current economic and policy environment. The growth in LRGs’ revenue from income taxes is likely to dip due to weaker corporate profitability, lower inflation, and a higher threshold (which the government introduced in late 2011) for personal income taxes. 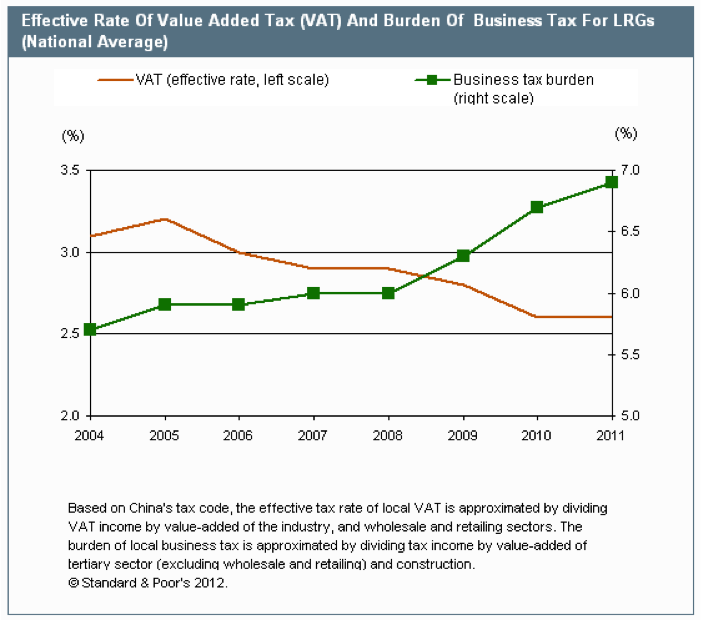 Moreover, we expect revenue from the value-added tax (VAT) to remain sluggish, in part because the effective tax rate (see chart 2) is unlikely to reverse its downward trend as many industrial firms struggle with weaker demand and higher production cost. Finally, revenue from business and real-estate-related taxes — which supported LRGs in 2009 — is likely to weaken this year. The revenue from land price appreciation will likely soften, even if a correction in housing prices boosts sales and transaction-related tax income. We believe the rise in the business tax burden (see chart 2) may moderate in 2012 as China (AA-/Stable/A-1+, cnAAA/cnA-1+) has started to experiment this year on a more business-friendly tax regime for the service sectors. This is part of the government’s effort to reduce reliance on manufacturing and investment for economic growth. To what extent can housing property taxes and higher mining tax contribute to Chinese LRGs’ revenue base? The contribution from broader revenue sources, such as housing property taxes and a higher mining tax, would benefit only a few LRGs in 2012 and to a limited extent. This reflects China’s cautious approach to tax reforms in these areas. For instance, the housing property tax introduced in Chongqing last year contributed less than one-thousandth of the municipality’s annual tax revenue. We also expect that not many LRGs would significantly benefit this year from “revenue smoothing” (collecting taxes payable carried forward from a bumper year, tightening tax exemptions, and collecting some taxes due in the next year). LRGs in developed areas normally have better compliance with tax codes and thus have a relatively limited scope for revenue smoothing, in our view. Their generally stable business tax burden over 2008-2010, according to our estimation, supports our assessment. What measures is the Chinese government likely to take to strengthen the financial positions of its LRGs? We believe the weak outlook for LRG revenues provides these governments an additional incentive to continue reforms to strengthen financial management, The central government has pushed many of these reforms that largely fall into two categories: (1) making better use of fiscal resources by better monitoring spending performance, cutting nonessential spending, and better tapping carry-forward reserves and central government transfers; or (2) deploying non-fiscal resources more effectively to achieve social policy targets, such as constructing public infrastructure and houses, while limiting LRGs’ out-of-pocket expenses. Many LRGs, particularly those where expenditure management is much weaker than that of the central government, have a large potential to cut non-essential spending. We believe that most cuts could happen under LRGs’ capital spending, which accounts for more than 15% of total spending for many. Some capital spending is avoidable, and some can be postponed. Indeed, we believe that the Beijing municipal government cut more than 25% of spending under government fund accounts in 2011 in response to meagre land premium receipts, and the Guangzhou city government took similar measures last year. In our view, the Chinese Ministry of Finance’s plan to improve standardisation and transparency of LRGs’ government fund budgets could play a major role in containing nonessential spending. Spending funded by money raised through land premia (ie, sale of land rights) — which is much less transparent than general budget spending — represented about 25% of LRGs’ total spending during the past two years. Are there any non-fiscal resources that Chinese LRGs can mobilise to weather a revenue slump? LRGs’ continuing measures to better deploy indirect public and private funds would alleviate pressure on capital expenditures in 2012. For instance, the Beijing municipality maintained its infrastructure investment last year at 2010 levels when the local government mobilised more resources via LGFPs. Our understanding is that the LRG met the banking regulator’s criteria for reclassifying some LGFPs as general commercial entities and made them eligible for new borrowing. Financially weaker LRGs could sell some stakes in state-owned enterprises to avoid a significant worsening of their financial positions. LRGs also seem to be more open to attracting private capital in infrastructure investment this year, including the establishment of investment funds with some outside seed funding. However, the use of non-fiscal funds could pose some problems for the LRGs because the government liability may not be clearly defined and communicated to lenders and investors. The burden to repay debt that related nongovernment entities incur could fall back on the governments later. In such cases, the ensuing contingent liability could compromise LRGs’ credit quality.